Storing antique furniture can be a daunting task, especially given the sentimental and monetary value antique furniture typically holds. The following storage tips can and should be applied to all furniture, old or new. But if you happen to be storing antique furniture, there's more riding on it, so you'll want to be especially diligent in following all of the tips below. If you're storing antique furniture and or heirllooms, you really need to go the extra mile and spring for climate-controlled storage unit, but if for some reason you must use non-climate storage, proceed with caution! If the furniture can be disassembled, you should do so. Remove table legs, headboards and footboards. Be sure to always store screws and all other hardware in a labled, zip-lock baggie. 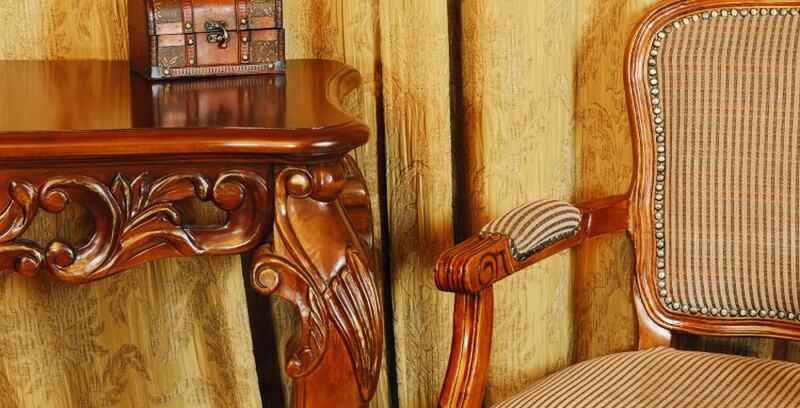 You should also clean and wax wooden items to provide extra moisture. If for some reason you're not using a climate-controlled storage unit, be sure to keep wooden furniture away from the door just in case some water seeps into the unit. When it comes to fabrics, particularly older fabrics like the one covering that couch Aunt Edna left you, be sure to clean them using an antibacterial cleanser. When it comes to brass, metal, or nickel, polish generously to prevent oxidation. Shrink wrap, shrink wrap, shrink wrap. As in you should shrink wrap EVERYTHING! The importance of shrinkwrap cannot be overstated, even if you are storing in a climate controlled, indoor facility. Every reputable storage facility goes to great lengths to protect your valuables from pests. A brand new, state-of-the-art facility like Climate Storage has an upper hand in this battle, but we still go to great lengths when it comes to pest cotrol to make sure we never have that problem. Regardless, you should do your part, too, no matter where you're storing. So wrap wooden furniture to prevent tiny insects that like to burrow, such as the dreaded termite, from finding a home inside your furniture. Wrap your fabrics, too. Bugs like to stay warm in the cold weather just like humans, meaning that couch or mattress can be awfully inviting. Even things that don't tempt pests, like metal furniture and heirlooms, should be shrinkwrapped to prevent dust from coating your treasures. It's never a bad idea to wipe down your metal pieces with a little oil before wrapping, either. Use some common sense when storing antique furniture and make sure your heavier items are on the bottom and your lighter items are on the top. The last thing you'd want is to crush Aunt Edna’s antique salt and pepper shaker collection. Also, if there is something you treasure so much that you like to take it out and stare at it every so often, keep it accessible by placing it close to the front of the unit. Remember, if it's worth storing, it's worth insuring. Particularly if you're storing antique furniture. So be sure to ask the manager of your storage facility about insurance. He or she can fill you in on coverage types and amounts. At Climate Storage, storing your valuables is our business. Still, even we would admit that storing antique furniture isn't the most fun thing in the world. But you know what's even less fun? Opening your storage unit only to discover your antique furniture is worse for the wear. But if you follow the steps above, you won't ever have to worry about that, now will you? If there's ever anything we can do for you, or if you have any questions about the moving/storing process, please don't hesitate to call us at 865-444-0919! We love any and all types of inquiries whether you rent from us or not.